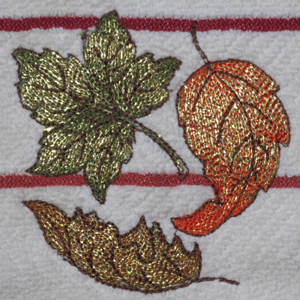 Another by request set , now NLE's popular AUTUMN WINDS Mylar Mini Set is available for those with only a 4x4 hoop! Bursting with the glorious and rich hues of Fall and accented by the glowing and elegant effect of Mylar , this gorgeous set is all you need for creating unique fall fashion and home decor. 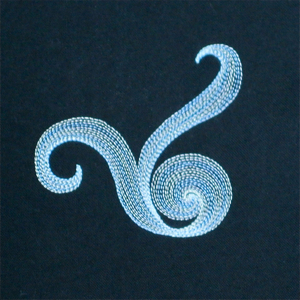 The samples shown here were done using gold, and copper foil mylar acented by varying thread colors . 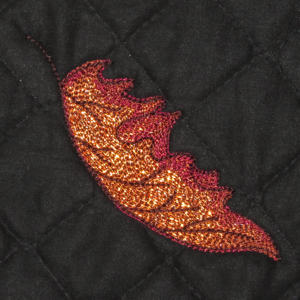 The sheer contoring of the stitcing defines the effects of the mylar colors used. 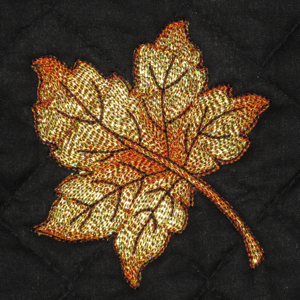 Changng your Mylar and thread colors gives you an endless combination of robust fall possibilities as varied as the creative choices and arrangements you make. 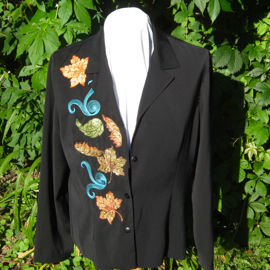 This jacket shown was done using a free style arrangement of the leaves and wind swirl. 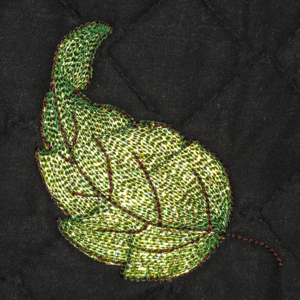 This mini set contains 5 individual design files, including each leaf in it's own file, the wind swirl and then a grouping of the 3 leaves as shown below, sttched on a towel.